This is a perfect 8' portable pong table to challenge your friends whether you are hanging out at home, tailgating or at a party. If you don't want to use it for beer pong then do not worry, this table can also be used for other drinking games or for setting things on. It is great for traveling because it folds up quickly and easily into a two foot by two foot square. The frame is made of aluminum so it is lightweight but durable and can be carried anywhere with its convenient carrying handle. Whether you are a professional player or just play casually for fun, this table is the ultimate way to spend the days with your friends. Our beautiful exclusively designed table comes with a durable constructed aluminum frame base with a melamine coated table top which protects against scratches, sun damage and beer spills. It's perfect for bouncing and easy to cleanup. 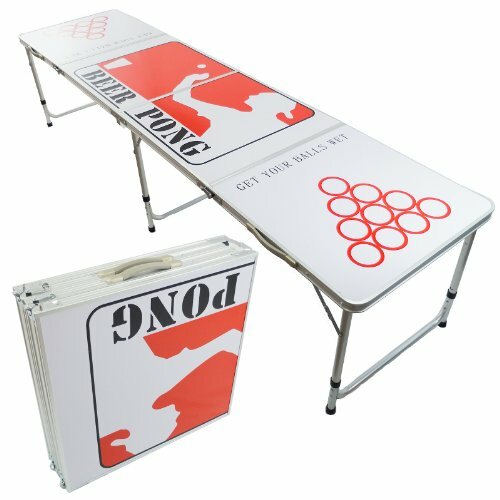 This official tournament sized table allows for great mobility by folding into a 2ft x 2ft briefcase. Now you can play regulation tournament beer pong anywhere. We purchase all of our products directly from the manufacturer, so you know you're getting the best prices possible. If you have any questions about this product by PONGBUDDY, contact us by completing and submitting the form below. If you are looking for a specif part number, please include it with your message.